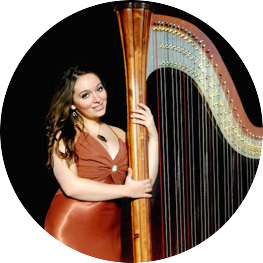 Sarah Rice is a Ventura harpist available for weddings, parties, and other events in Ventura and surrounding areas. Sarah studied harp performance at the Baldwin Wallace Conservatory of Music and is working on her master’s degree in Harp Performance and Composition at California Institute of the Arts in Santa Clarita, CA. She performs with orchestras throughout the U.S. and has worked with such artists as Jo Dee Messina, the band America, and Chris Thile. Sarah has released three CDs of her own compositions. Her repertoire includes classical music as well as her own arrangements of pop tunes, hymns, and folks tunes. For more info and to hear audio clips please click here.